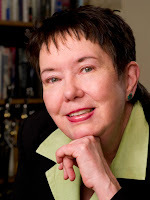 I'm pleased today to share an interview with Rosemary McCracken. Rosemary McCracken's debut mystery Safe Harbor is now in production at Imajin Books. Release date will be announced soon. 1. How did you come up with the character Pat Tierney, “a 40-something widow who balances a busy financial planning practice, a hectic family life”? There's a shortage of mature female characters in crime fiction – characters over the age of 40 with whom baby boomers can identify. So I married a whodunit plot to the story of a woman going through a life-altering event. In chapter one, Pat learns that her late husband fathered another woman's child; soon after that, this woman is found murdered. I made Pat a financial planner because, as a journalist, I've written extensively about personal finance and interviewed hundreds of people in the financial services industry. Pat exemplifies their best traits. 2. “Last Date” and “Safe Harbour” – what kinds of titles do you have in mind for future Pat Tierney novels? Will you stick with two-word titles? I find it difficult to come up with titles because journalists do not write the headlines for their own articles. I'm about three-quarters through the first draft of the sequel to Safe Harbor and I still don't know what its title will be. Two words, probably. Something short and punchy. 3. You’ve worked as a reporter and journalist, and have written on a variety of topics, including business. And, you’ve heard the expression “truth is stranger than fiction.” What real life white collar crime story is TOO BIZARRE to turn into a novel? No crime, white collar or other, is too bizarre for a novel. Pedophilia, trafficking in human body parts – nothing is sacred. A particularly sordid crime story involving a financial planner is that of Canada's own Albert Walker, the convicted murderer and embezzler who ran off with his clients' money and his own 15-year-old daughter. When the Walkers were finally found in England some years later, they were posing as a married couple with two small children. It's always been assumed that Walker fathered the kids. Pretty creepy, but I can see a writer like Kate Atkinson pulling it off with style. I find a short story far more difficult to write than a novel. A short story looks deceptively easy but it needs to say a lot with a few words, and has to be tweaked and tweaked and tweaked. A crime story also requires a twist, or better yet a double twist, at the end. Not easy to do. Novels suit me better, allowing me to bring in a larger cast of characters with more space to develop them. And that's what I find enjoyable: getting to know my characters. 5. As a mystery reader, what is the one thing an author can do (with the plot or the characters or or or ...?) that would turn you off? I don't enjoy stories that are unresolved at the end – government conspiracies that the hero will never get to the bottom of, characters who vanish at the end of the book leaving the reader wondering whether they died in the final confrontation or ran off to start new lives. I don't necessarily want happy endings – the hero can die – but I like to see order restored to the world at large. 6. As mentioned above, you’ve done all kinds of writing (magazines, newspapers, etc.) for quite some time. What are the challenges to you when it comes to writing fiction versus nonfiction? Most journalists have been trained to write "hard news" – breaking news stories that require covering the 5 Ws: who, what, where, when and why. As well as "how" and, when applicable, "how much." Journalists use adjectives and description sparingly; a photo will often supply the description. This kind of background enables me to write tightly and has given me a fairly good command of grammar. The downside is that description doesn't come easily to me, nor does lyrical language. But coming up with fictional characters and situations has never been difficult. It's a joy to let these imaginary people, places and events surface after all those years of sticking to the facts! 7. What character from fiction (not necessarily mystery fiction) would you like to bring to life for just one day and why? I'd love to spend a day riding around with Mickey Haller, the title character of Michael Connelly's The Lincoln Lawyer, who conducts his practice out of his Lincoln Town Car. If Haller came to life looking like Matthew McConaughey, who played the role in this year's film adaptation, that would be one hell of a ride! 8. Imagine writing an online dating profile (Google “LavaLife” or “PlentyOfFish”) for Pat Tierney. What would her dating profile say? Pat's profile on LavaLife would read: CLASSACT – Life is full of surprises! Age: 47. Location: Toronto, Ontario. Height: 5'7". Body type: slim and fit. Ethnic background: Irish Canadian. Religion: lapsed Catholic. Smoking habits: non-smoker. Zodiac: Pisces. 9. Name two mystery authors who influenced you. Elaborate on this as desired. Ruth Rendell has influenced me for years with her wonderful, often grotesque characters and creepy settings. And Kate Atkinson is currently working in the same tradition, with an added touch of humor. There is something truly fabulous about British crime writers. It must be all that fog and mist and dampness! 10. What murder weapon/manner of death would you like to use in your next mystery? My sequel to Safe Harbor has a character who dies when he drives into his garage and it bursts into flames. 11. (This one is a freebie... What is the question you wish I had asked you but didn’t. Now, go ahead and ask and answer that question.) Who would you like to play Pat Tierney in the movie adaptation of Safe Harbor? I have two fortysomething actresses in mind. Nicole Kidman. And Jodie Foster, who has her own production company! Visit Rosemary McCracken's website at www.rosemarymccracken.com and her blog at http://rosemarymccracken.wordpress.com/ . Follow Rosemary on Twitter @RCMcCracken and at www.facebook.com/rosemarymccracken.